Marvel Comics has debuted another “first” in comics history: the first time a character, Luke Cage, has been diagnosed with Chronic Traumatic Encephalopathy (CTE) – a degenerative brain disease suffered most often by athletes, military veterans, and others with a history of repetitive brain trauma. Reaction so far has been huge, with coverage crossing over from comics media to mainstream. "Luke Cage’s impenetrable skin and super strength make him one of the most powerful brawlers in Marvel’s comics universe, but years of throwing himself at villains has led to a devastating problem for the hero — as well as one of his most interesting storylines yet," stated sci-fi fantasy blog i09. Luke Cage: Everyman is back with the digital release of its second chapter worldwide today. Created by writer Anthony Del Col, artist Jahnoy Lindsay, and Eisner Award-nominated Ian Herring on colors, Everyman finds Cage battling not only his CTE neurological syndrome but also a serial killer calling himself “The Everyman” attacking the wealthiest one percent of Harlem in the midst of a horrible heat wave. 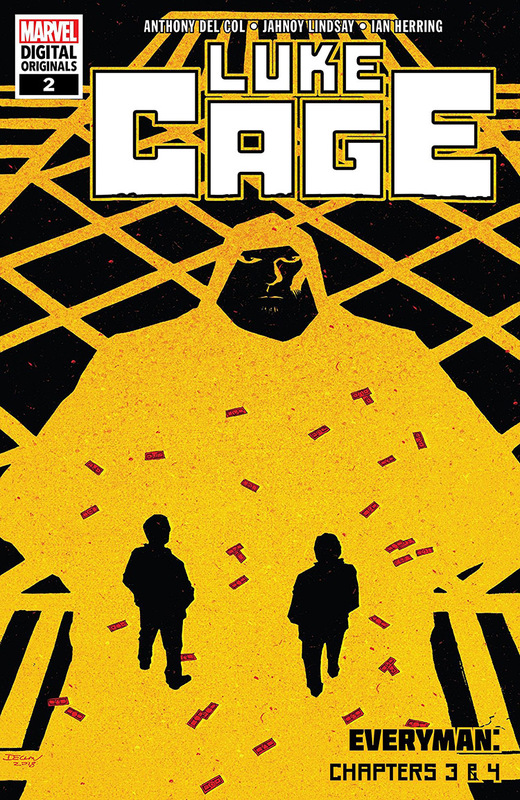 In this new chapter, Cage continues to hunt down The Everyman with help from his good friend, Iron Fist, but quickly realizes his own time may be running short. It’s fitting that the series is being released just as the NFL football season is beginning. CTE is a huge issue among veteran players and continues to embroil the league in controversy. Luke Cage: Everyman is part of Marvel Now's Digital Only initiative (along with new tales of Jessica Jones and Iron Fist), making the stories even more bingeable. Chapters 1 and 2 are currently available at the Marvel Digital Comics Store and ComiXology, and third and final chapter of the series drops October 17. In addition, the entire collection will be available on trade paperback November 14 of this year.